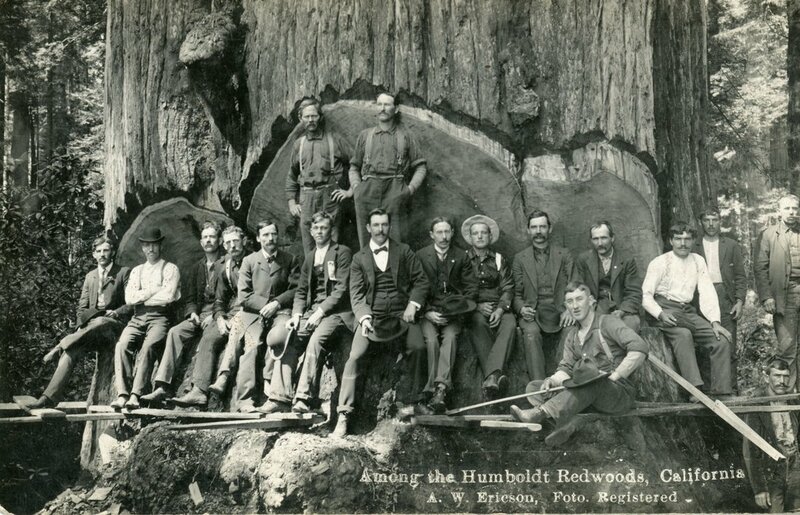 ​Logging as a livelihood in Humboldt County is nearly as old as the county itself. When settlers first arrived in Humboldt Bay in 1850, the forests in some areas came right to the bay. Settlers cleared small areas to build and heat their homes, build their businesses and, as miners came to look for gold, residents built mining towns and shops for supplies. ​The earliest commercial loggers cut down tanoaks, spruce, and fir, as many of the early loggers to the area were more familiar with these trees-and had logging equipment that could handle the normal-sized trees. Ambitious loggers, engineers, and millworkers began designing equipment to handle the larger old growth redwood trees, and this technology-funded by demand for more lumber with building booms in the United States, changed the course of logging in the northern redwood forests of California forever. One of those inventions was the Steam Donkey, which made hard to access trees more accessible. ​With thousands of new immigrants moving the California during the gold rush, there was money to be made on the development that followed mass migration. The Redwoods around San Francisco Bay had been logged as rampant development led to deforestation. The logging industry began to pick up pace here in the mid-1850s. There were not too many mills in operation at the time, but when rumors of gold in the Trinity River surfaces, many of the loggers made their way from the mills to the mountains to strike claims, draining the local lumber workforce and driving lumber prices through the roof. At the same time, demand for lumber was rising as boomtowns began growing on and near the Trinity River, along with towns around the bay, which profited from newcomers preparing to travel to the mines. 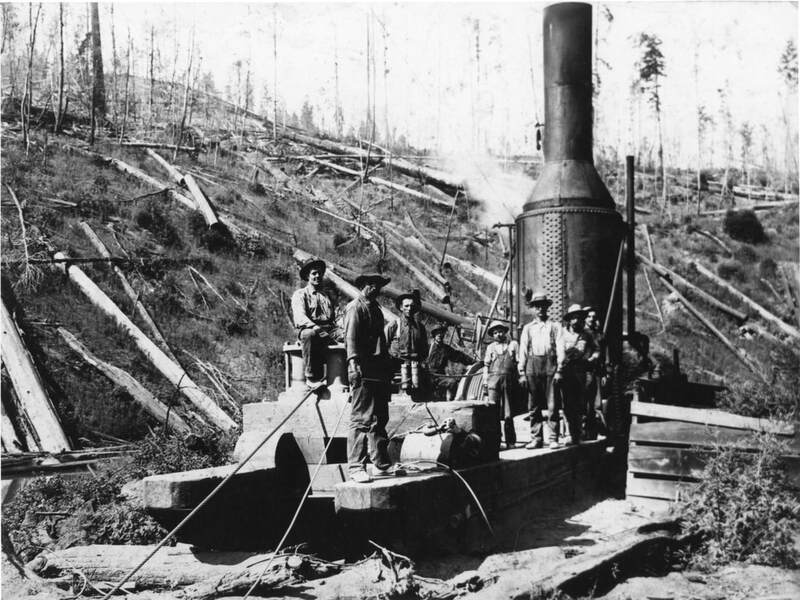 This turn of events attracted investors and workers to the area to build more mills to accommodate the rapid growth of logging companies taking advantage of the temporary price hike in lumber. 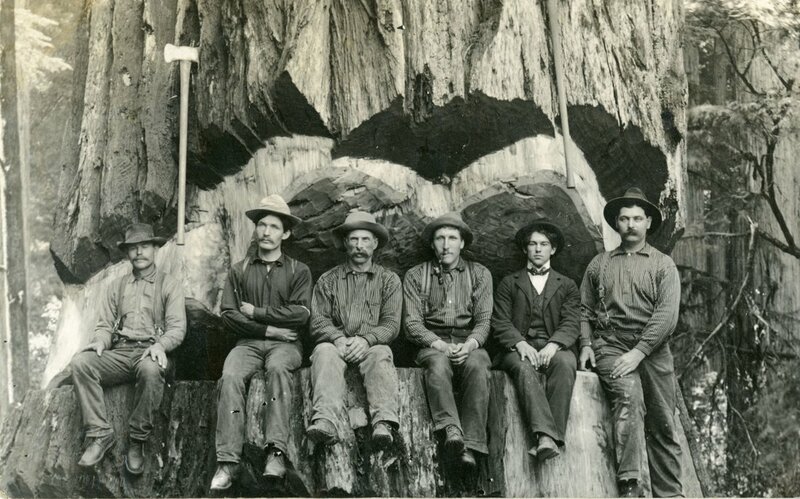 As the Gold Rush in Humboldt County (which had been focused around the Trinity River) began to slow down, unemployed miners were picked up by rising mills and lumber companies to start mining for “green gold”: the redwoods. Redwoods logged in Humboldt County were marketed to sellers on the East Coast, Hawaii, and Tahiti as a wonder wood-resistant to bugs, fire, and rot. The market expanded over time, especially when fires roared through San Francisco in 1906, burning many parts of the city to the ground and thereby increasing demand for lumber. 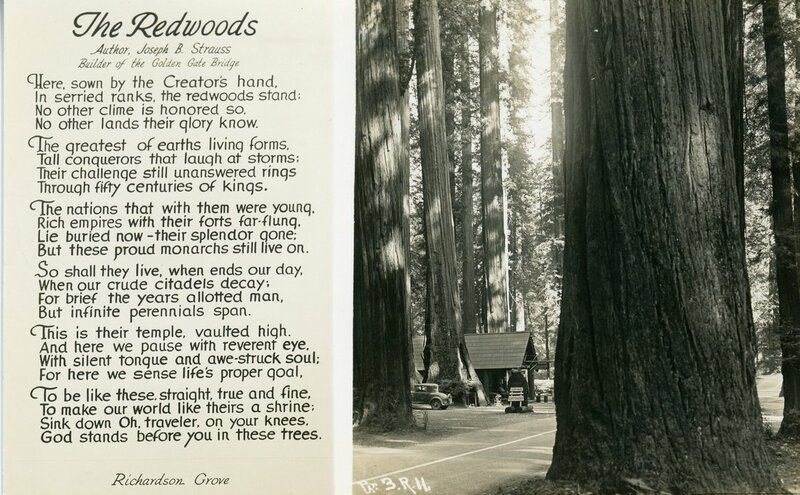 Redwood as a construction material grew in popularity as logging tools and transportation improved, making previously inaccessible stands of old growth easier to reach. ​Following WWII, there was a building boom in the United States. 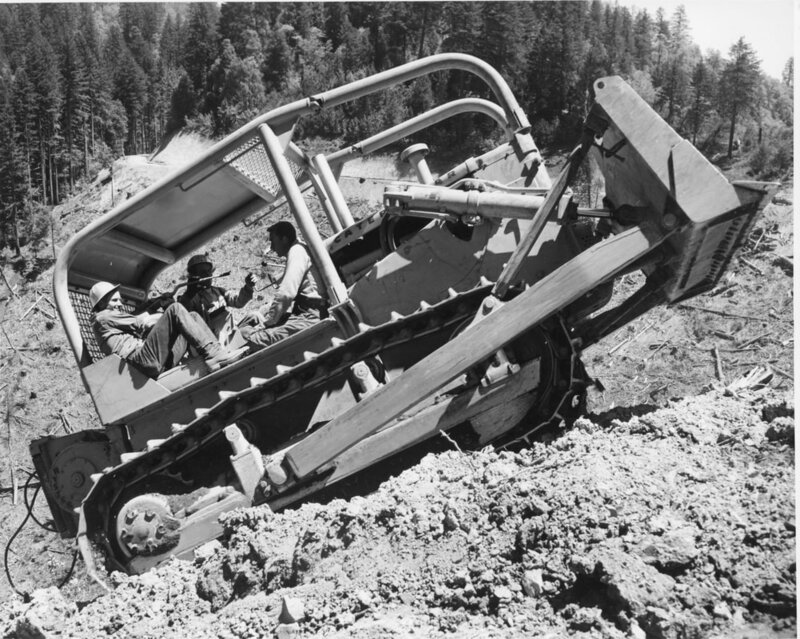 Paired with advanced bulldozer, chainsaw and transportation technologies developed and improved by the military during the war, less people were needed to log larger areas and more lumber was being pulled from the forests in record time. Going into the 1960s, There was debate over how long the forests would be able to provide for the quickly advancing demand-some scientists questioned the forests being able to produce into the 1980s, some companies claimed stands of old growth still had 50 years before they were exhausted. Others still claimed that it was a matter of a few years before every privately held old growth tree was felled. ​The companies fought claims of outright destruction by opening certain areas to recreational usages from camping to hiking. Companies like Arcata Redwood Company, owners of the Tall Trees area on Redwood Creek, began leading tours of their land, including offering visitors a look at the tallest trees and demonstration forests nearby, to show visitors how the local industry was a sustainable industry. Pamphlets, newsletters, and fliers describing the industry’s focus on sustainability were distributed to help bolster the industry’s image locally and nationally against preservationist opposition. "The Tree Farm sign displayed by Tree Farmers is a sign of good forestry practices, and a sign that today's timber harvest will make more room for tomorrow's crop to grow- and to thrive. Tree Farmers pay taxes just like any other land owner." ​It had been a longtime policy of leaving a screen of redwood trees along major highways and thoroughfares to allow tourists a nice view of the Redwoods as they drove through Humboldt County, however for an unknown reason, in 1964, Arcata Redwood Company decided to cut a stand of redwoods straight down to the highway, known as the Berry Glen Cut, pictured to the right. This harvesting opened a small view into the effects logging had on the landscape in the short term and sparked outrage against the companies. Paired with the release of the Redwoods survey conducted by National Geographic that found the world’s tallest tree to be held on private land-the Arcata Redwood Company Tall Trees area, national support was galvanized for the government to intervene by protecting the area around Redwood Creek. 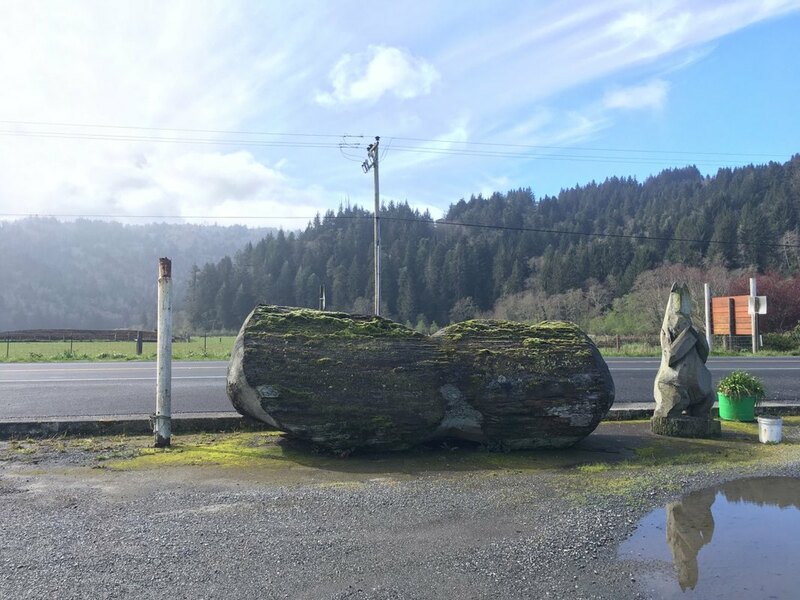 ​By the 1960s, generations of Humboldt County men had worked in the lumber industry, which made up approximately 70% of the county’s industry market at that time. Proposals for 50,000 to 90,000 acres to be purchased for a new National Park was a major threat to some of the logging companies in the area - and their workers. The companies and their workers went on the offensive, companies like Simpson, Louisiana Pacific, Arcata Redwood Company (ARCO) and Georgia Pacific produced pamphlets denouncing the park plans, encouraging that workers contact their congresspeople, promoting awareness of measures put in place by the companies to ensure continued growth of trees in logged areas, and speaking at congressional hearings. Companies claimed that they would have to lay off many of their workers should the park plan proceed. Some companies stated that they would have to close if they lost their land to the Park. The lumber companies and workers promoted an image of the industry being one that had a symbiotic relationship with the forests. Companies functioned as stewards of a resource whose production could be optimized with a helpful human hand. Companies offered tours to the public, allowing them to see the measures being undertaken to ensure that redwoods as a species would not die out. 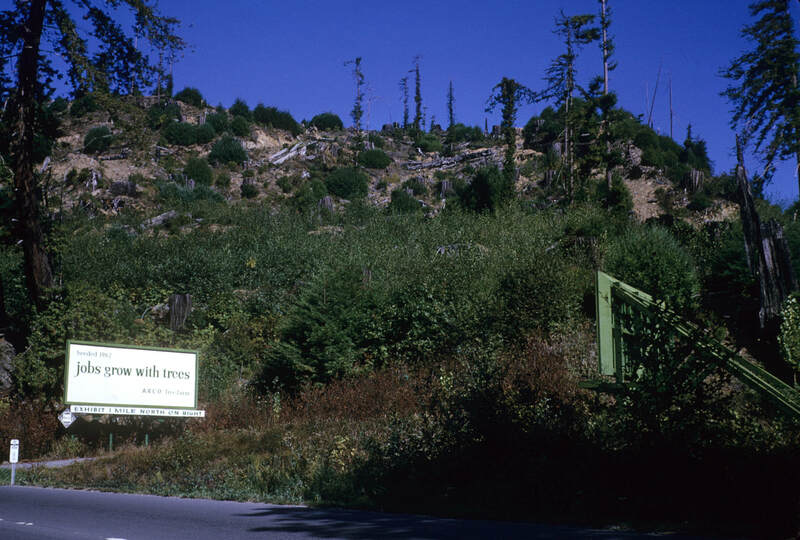 The photo above includes a sign related to these positive promotional measures, showing an area that was logged and reseeded in 1965, two years prior to the logging operation that took place there. 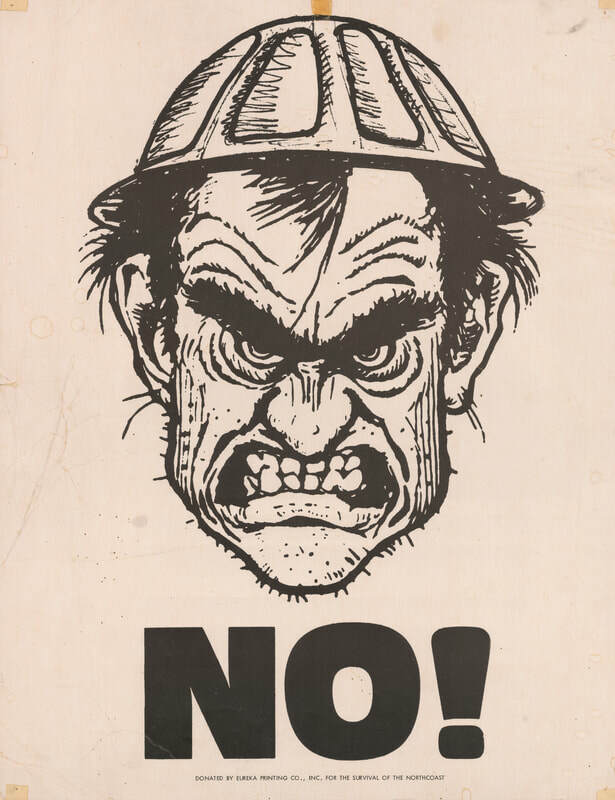 The angry logger poster pictured here was one that would have been used as part of the protests against the parks. 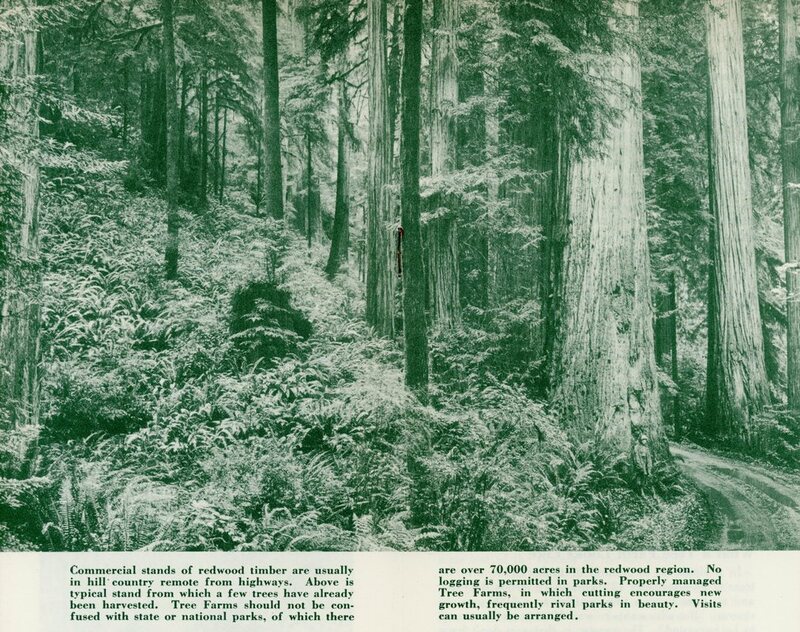 "1000's of DEAD GIANT REDWOODS going to WASTE NOW in PARKS"
Following the Park establishment in 1968, an expansion was proposed to combat damage done by uphill logging in the Redwood Creek watershed, which was only partially preserved in the park. Companies released reports claiming that the damage to the downslope groves could not be directly attributed to the logging companies. 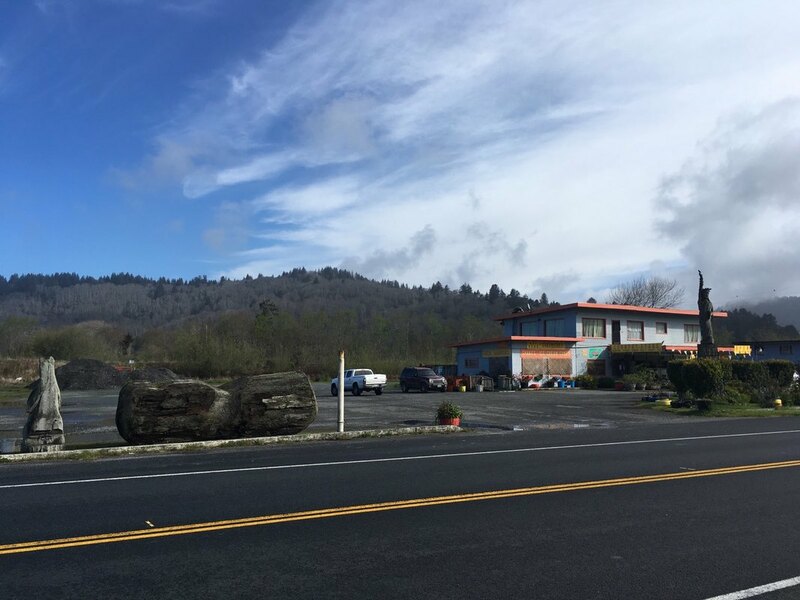 With the expansion being discussed, members of many different logging companies came together for a formalized protest that would take the group from Eureka, CA to Washington DC. In 1977, 25 truckers hauling unprocessed and processed lumber products drove across country to protest at the US capitol in a convoy known as the “Talk to America” convoy. Leading the procession was a 9 ton carved piece of redwood that was roughly hewn to resemble a Peanut. This Peanut was meant as a mock gift for President Jimmy Carter, with the saying that “it may be Peanuts to you but it’s jobs to us.” The convoy was greeted in DC by 400 additional logging industry workers who gave speeches and held signs outside of the capitol building. When presented with the Redwood Peanut, Jimmy Carter’s aids turned the gift away as a "waste of a perfectly good redwood”. The convoy, and its peanut cargo, returned to Eureka and then Orick, where it remains to this day in the parking lot of the Shoreline Market. Photos above: Screenshots from documentary Enough is Enough which can be viewed online for free here. Coast Redwood: A Natural and Cultural History by Michael Barbour, et al.